The financial crisis left its traces to the French maritime industry in 2009. The total turnover in this sector decreased from 54 billion euro in 2008 to 45 billion euro in 2009, a decline of 17%. Especially the civil maritime industry has been hit hard by the economic slowdown. However, in that same year ship building for defence purposes has been flourishing like never before. Demand for the French submarines of DCNS, built in the shipyards of Saint-Nazaire, rose exponentially. 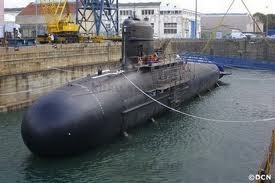 France sold four Scorpène submarines to Brazil. This product group has been of big importance for the record export sales of the French defence industry, approximately 8 billion euro that was made in 2009 (21% growth in comparison with 2008). Furthermore France expects to be able to deliver two of the four BPC ships for military transport, which Russia plans to order in the remainder of 2010. But other sub sectors proved to be lucrative too. The offshore industry for example had a turnover of 9,1 billion euro in 2008, of which export accounted for 90%, and provided 28.000 jobs. If we compare this with the turnover in 2001 (5,2 billion euro), we may conclude that the market is increasing sharply. The economical crisis did bring a tremendous disappointment for the global production of pleasure cruisers in 2008. It had a big impact on France, being world leader in the production of yachts and rubber boats, and being ranked fourth in the list of motor boat producers. France exports 66% of its production. France considers itself as European leader in the construction of defence ships, rescue operations with aircraft carriers, scientifical research, construction of yachts and rubber boats and seismic studies. The country assigns itself a second position when it comes to offshore and oil, construction of passenger ships, pleasure cruising and services like financing, insurance and classification. World class players are DCNS (defence ships, submarines and related equipment), STX France (cruise ships, container ships, gas tankers), CMN (fast defence ships and patrol boats, but also motor yachts from 25 to 73 meters, racing and luxury sailing yachts and passenger boats for 100 to 150 persons) and Cegelec (development and maintenance of technical installations, ships, onshore and offshore infrastructure). Most innovation takes place in defence ship building, often on behalf of the government agency DGA (Direction Générale de l'Armement). Here one focuses frequently on exploiting defence technology for civilian applications, like the R & D project SISMARIS, drawn by the DCNS Group. As a response to the national sustainability plans ‘Grenelle de l'Environnement’ and ‘Grenelle de la Mer, France has to opened up for a significant number of initiatives which lead to more sustainability within the maritime sector. French industry associations launch initiatives to put their members on the right track, such as the Fédération des Industries Nautiques with the program ‘Bateau Bleu’ and Armateurs de France with the ‘Charte Bleu’.